10 of the best spots for date night in the East Village. 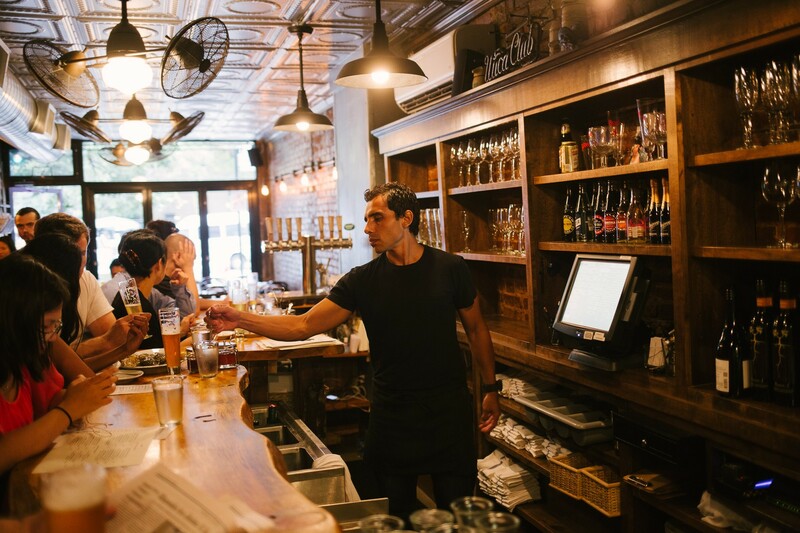 15 of our favorite neighborhood establishments across NYC. You might be wondering how it’s possible to grade a world-renowned restaurant like Per Se on the same scale as we would a tiny oyster and beer bar in the East Village. It’s quite simple, actually. Regardless of the level of sophistication or style of cuisine at any given establishment, it all comes down to whether or not a restaurant resonates with us. Upstate may be relatively unheard of and fit to seat less than twenty people at a time, but we think it deserves a high rating on this site. And assuming you aren’t here just to write us hate mail, we think you’re going to like it, too. We can’t say enough good things about this place. The East Village needed a friendly neighborhood oyster bar in the worst way, and Upstate throws down like Amar’e with two hands. This one hits me right in the heart, too. I went to college upstate (Ithaca), and to find a bar that proudly serves Ithaca Caskzilla and Saranac on tap is a beautiful, beautiful thing. Everything served and sourced by Upstate is locally produced: cheese from Valley Shepard Creamery in New Jersey, meat and (incredible) pasta from Russo’s Mozzarella and Pasta on 11th street, Southhampton Beer, Wölffer wines - as long as it’s independent, small, and locally crafted, they can get on board with it. There’s no big name restaurateur at Upstate (it’s actually the same guys who used to run Shaffer City), nor will you find gimmicks, a press release, or even a freezer for that matter. The simple menu is small and ever-changing, depending on what’s fresh and available. There are always oysters - usually over a dozen options from both the East and West coasts. Other staples include beer-steamed mussels, scallops, and a ridiculous fettuccine with clams. Every menu item costs less than twenty bucks, and literally every single thing we’ve tried has been delicious. For a true seafood lover, this is heaven. When you go, you’ll no doubt meet Shane, who runs the joint. He’s the man. He’ll remember you after one visit. He recognized us right away after our first, brief stop-in. “Yeah, you guys were in here last week. You guys are movie stars or something, right?” Nope, and we will take that as a compliment even though it probably wasn’t one. We’re just two guys who are going to be sitting at your bar drinking beers and slurping oysters once a week for the foreseeable future. Upstate sports an insane selection of both East and West coast oysters. Big, small, briny, creamy - whatever your preference may be, it can be accommodated. And the best part? They each cost around two bucks. We’ve got one complaint though... why no mignonette? Let’s rectify that situation, please. It’s costing Upstate 0.3 points in this review. They seem to be prepared differently each week, but the scallops are picked fresh every day from the local seafood market and, when we had them most recently, were served over a farmers market zucchini and squash salad. Refreshing and delicious. Wow. This bowl of pasta is special and worth a trip on its own merit. This is easily the best pasta with clams in the ’hood and will be going into weekly rotation immediately. If you like shellfish and you like the taste of saffron, you’ll really enjoy this slow-simmered fish stew. Since Upstate can’t serve Jameson on the rocks, they figured they’d do the next best thing - line their complimentary dessert cake with it. This is a beautiful homemade cake laced with whiskey, which means we’re either going to eat it or wring it out over a glass. It’s also free with your purchase of dinner. Instead of waiting outside of it for brunch, hit Prune for dinner. ROKC is a restaurant serving ramen and oysters, but this place is all about the cocktails, which get served in lightbulbs and conch shells.